Command Sgt. 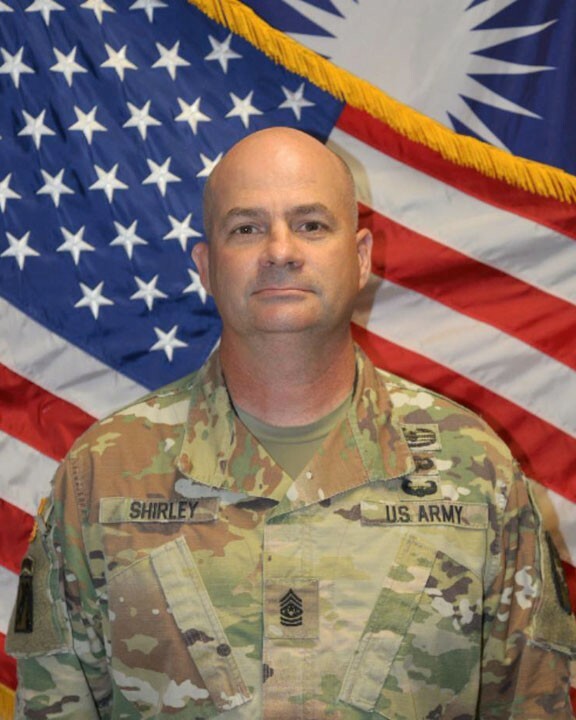 Maj. Todd J. Shirley assumed responsibility as Command Sergeant Major of U.S. Army Garrison Kwajalein Atoll on Sept. 13, 2017. 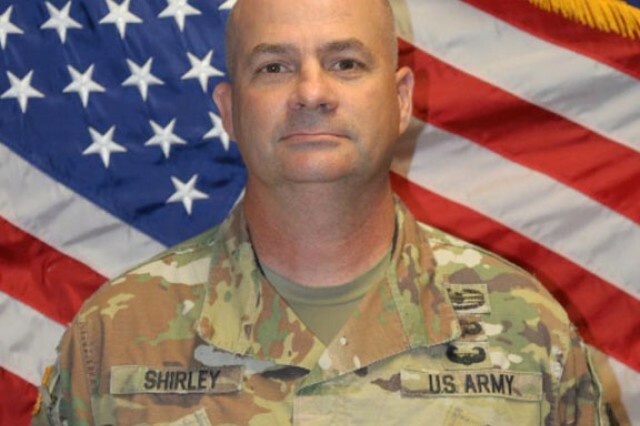 CSM Shirley enlisted in the United States Army on Oct. 1, 1991. He attended Basic Combat Training and Advanced Individual Training at Fort Jackson, South Carolina. His previous assignments include: 18th Combat Sustainment Support Battalion, Adjutant General School and Regimental CSM, J1 Sergeant Major, United States Forces -- Afghanistan, Kabul, Afghanistan; G1 Sergeant Major, XVIII Airborne Corps, Fort Bragg, North Carolina; G1 Sergeant Major, United States Army Special Forces Command (Airborne), Fort Bragg, North Carolina; Operations and Human Resources Noncommissioned Officer, United States Army Aviation Support Activity, Fort Eustis, Virginia, Command Group Administrative Noncommissioned Officer, 1st Personnel Command, Heidelberg, Germany; Deputy Chief of Staff for Intelligence Administrative Noncommissioned Officer, Training and Doctrine Command, Fort Monroe, Virginia; Administrative Noncommissioned Officer, 4th Personnel Services Battalion, Fort Carson, Colorado; Administrative Clerk, 226th Medical Battalion, Pirmasens, Germany. His military education includes the Primary Leadership Development Course; Basic Noncommissioned Officer Course; Advanced Noncommissioned Officer Course; Basic Airborne Course; Air Assault Course; Survive, Evade, Resist, Escape (SERE) Course; Sergeants Major Course (Non-Resident Course Class 36), Sergeants Major Force Management Course, Battalion and Brigade Pre-Command Courses. His Civilian education includes a Master's Degree in Teaching and Instruction from Trident International University, a Bachelor's Degree in History from American Military University and an Associate's Degree from Connors State College. His awards and decorations include: the Legion of Merit, Bronze Star, Defense Meritorious Service Medal (1 OLC), Meritorious Service Medal (4 OLC), Joint Service Commendation Medal, Army Commendation Medal (4 OLC), Joint Service Achievement Medal, Army Achievement Medal (5 OLC), National Defense Service Medal, Armed Forces Expeditionary Medal, Kosovo Campaign Medal, Iraqi Campaign Medal (w/3 bronze stars), Afghanistan Campaign Medal (w/2 bronze stars), Global War on Terrorism Expeditionary Medal, Global War on Terrorism Service Medal, Good Conduct Medal (7th Award), Military Outstanding Volunteer Service Medal, Noncommissioned Officer Professional Development Ribbon (w/Numeral 4), Army Service Ribbon, Overseas Service Ribbon (w/Numeral 2), North Atlantic Treaty Organization Medal, Air Force Basic Training Ribbon, Army Superior Unit Award, Combat Action Badge, Basic Parachutist Badge, Air Assault Badge, German Schützenschnur (Gold), German Armed Forces Efficiency Badge (Silver), German Parachutist Badge, Chilean Parachutist Badge and Drivers Badge. He is a recipient of the Adjutant General's Corps Achievement Medal, Adjutant General's Corps Order of Horatio Gates Bronze and Gold Medals.